(*temporary) = "attempt to index global 'Details' (a nil value)"
STRING_WELCOME_31 = "|cFFFFFF00Right clicking|r anywhere in the window shows the |cFFFFAA00Bookmark|r panel. |cFFFFFF00Right click again|r closes the panel or chooses another display if clicked on a icon. |cFFFFFF00Right click|r on title bar to open the 'All Displays' panel. |TDetails\images\key_ctrl:14:30:0:0:64:64:0:64:0:40|t + Right Click to close the window." STRING_OPTIONS_TEXT = "Bar Text Settings"
STRING_TUTORIAL_OVERALL1 = "adjust overall settings on options panel > PvE/PvP." 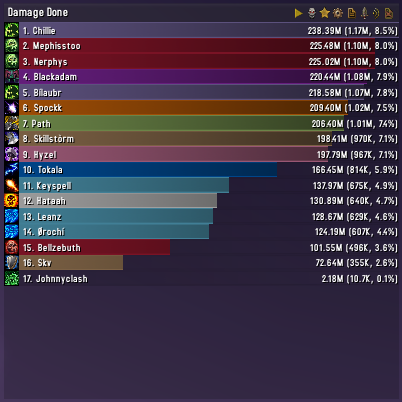 STRING_REPORTFRAME_COPY = "Copy & Paste"
STRING_SLASH_WORLDBOSS_DESC = "run a macro showing which boss you killed this week." STRING_OPTIONS_DATABROKER_TEXT_ADD6 = "Player Effective HPS"
STRING_OPTIONS_CHART_PLUGINWARNING = "Install Chart Viewer Plugin for display custom charts." STRING_CUSTOM_DESCRIPTION_DESC = "Description about what this display does." STRING_OPTIONS_ANIMATESCROLL_DESC = "When enabled, scrollbar uses a animation when showing up or hiding." Has your friend tried reinstalling the addon?